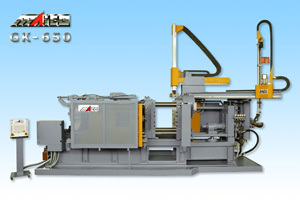 MAICOPRESSE is now well-known with its lines of die-casting machines GK and GKL. These two series distinguish themselves thanks to their truly innovative patented system of external toggle which enable to reach very long strokes. Opening-clamping speed is faster than that of ordinary machines and overall dimensions get smaller. GK series horizontal cold chamber machines from 230 to 3500 ton. 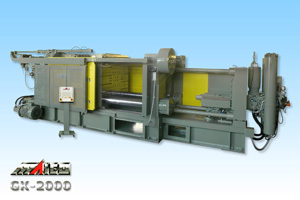 GKL series horizontal cold chamber machines, from 350 to 2000 ton with long mobile platen strokes. Integration of 6-axes robot by KUKA.